This website at www.recruitsure.com (the "Site") is owned and operated by Anson Reed Ltd.
References in these Terms & Conditions of Business to "you", "your" or "yours" are to be taken as references to the Site user or visitor, except where stated or where the context requires otherwise. The Materials and Services provided by Anson Reed Ltd to which these Terms & Conditions relate are set out below. In entering our Site, you as a user are accepting these Terms & Conditions. "Anson Reed Ltd." means Anson Reed Limited whose registered address is at 145-157 St John's Street, London EC1V 4PY and whose Registered Number is 05051678. "RecruitSure" means all works created by or for Anson Reed Ltd including but not limited to online and CD based interview training modules, interview questions, answer guides, downloadable pdf reports, MP3 files, videos, information, documents, files, text, graphics, and all other related works whether written or in any other medium. All orders made by you and accepted by us www.recruitsure.com are subject exclusively and strictly to these Terms and Conditions. All orders made by you through the web site are subject to acceptance by us. We may choose to subject your order details to additional security checks after you have submitted your order, depending on the outcome of these enquires, we may decide to cancel your order. RecruitSure will be available once clients have completed the appropriate payment process and set up an account. Anson Reed Ltd reserves the right to reasonably withhold RecruitSure from those who violate such standards or breach any of these Conditions and/or to cancel the registration of Registered Users who are guilty of non-compliance. 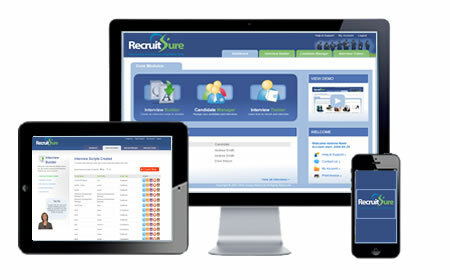 Registered Users will be able to access RecruitSure for 12 months from the date of purchase. Access is unlimited during this period and users will have automatic access to all upgrades. RecruitSure is a digital based product helping employers recruit employees and conduct job interviews. Access to RecruitSure is a subscription based service with initial subscription based on a 12 month period. Access can be made from any computer in any location. All details, descriptions and prices for these products appearing on the web site are correct at the time when the information was entered. We reserve the right to adjust the price and specification of any item on the web site at our discretion. We reserve the right to withdraw any items from our web site at any time. The total cost of your order is the price as quoted and includes all taxes. Payment can be made by most major credit or debit cards. Payments are processed via Worldpay secure facilities and subject to their validation checks and authorisation by the card issuer. We are not responsible for any delays or losses if the issuer of your card refuses to authorise payment. (b) Any representation, statement or tortious act or omission including negligence arising under or in connection with the Conditions. All warranties, conditions and other terms implied by relevant and applicable national and international law are, to the fullest extent permitted by law, excluded from these Conditions. (b) Anson Reed Ltd shall not be liable to you for any indirect or consequential loss or damage costs, expenses or other claims for consequential compensation whatsoever (howsoever caused) which arise out of or in connection with the Conditions or for any acts, omissions or negligence of third parties e.g. internet failures. (c) Anson Reed Ltd will not be liable in respect of any recruitment or employment decisions or claims made on the basis of or derived from using RecruitSure. For the avoidance of doubt, Anson Reed Ltd are not responsible for any results, job offers or lack of as a result of using RecruitSure. In any event, Anson Reed Ltd shall not be liable to you or any third party under, or in connection with, these Terms and Conditions in contract, tort, negligence, pre-contract or other representations or otherwise for any economic loss including without limitation, loss of revenues, profits, contracts, business or anticipated savings or for any special or indirect losses whatsoever. Anson Reed Ltd have made every attempt to make sure that RecruitSure and related files are free of viruses and we do not accept any liability for any damage to your computer system or loss of data that results from the use of RecruitSure. Notification is given to us within 7 days of the purchase date via email with full details and reasons for the request for refund. Refund will be made by via WorldPay and is payable to the original card holder only. In circumstances where digital products fail to function we will use all reasonable endeavours to provide you with replacement products. Should this not function a full refund will be made in accordance with the conditions above. Without prejudice you acknowledge and agree that all copyright, trade marks and all other intellectual property rights in all material existing in the products, design, structure, graphics, and all content remains the property of Anson Reed Ltd.
You are permitted to use the content only as expressly authorised by Anson Reed Ltd and you acknowledge and agree that the content comprised within these products is made available for your personal non-commercial use only. This Site is protected by international copyright and other proprietary rights laws. You may not copy, modify, reproduce, perform, display, distribute or create derivative versions of the contents of this Site or those pertaining to RecruitSure. You may not, or allow third parties to, duplicate, transmit, modify, adapt, create derivative works of or in any way commercially exploit any of the content. You Agree that: You will use RecruitSure only in accordance with these Terms and Conditions of Trade and only for lawful purposes and in a lawful manner. We may change these Terms and Conditions at any time and will publish their replacement on this web site. These Terms and Conditions of Trade shall be governed by the laws of England and you agree to submit to the exclusive jurisdiction of the High Court of England & Wales.